Don't forget to pop by this weekend to the worlds greatest TR show, the TR Register International Weekend at Harrogate. 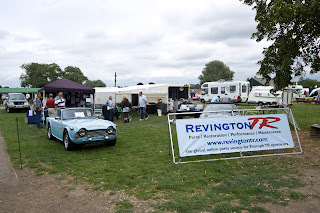 Revington TR will be present showcasing our great range of original, reproduction and improved parts. The much anticipated TR4 Police Car will also be present, which Neil has carefully restored to original factory condition, all the police equipment is in place with only a few bits of trim to finish it off, a must see for this years weekend. Revington TR will also be selling the Vanguard models of this vehicle a nice addition to any collection. If you wish to place an order for any parts for collection at the show, please let us know before Thursday. We look forward to seeing customers old and new, it is always a great opportunity to catch up, we hope to see you there!